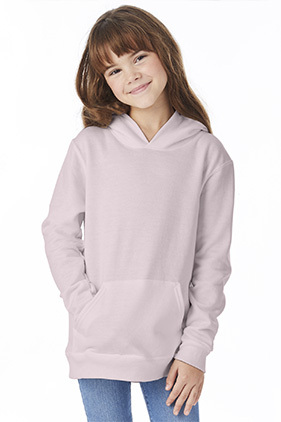 50% cotton/50% polyester 7.8 ounce hooded youth sweatshirt. Made with up to 5% polyester from recycled plastic. Low pill, high-stitch density fabric. Roomy front pouch pocket. Double-needle stitched armholes and waistband. No drawcord for safety.